In Japan Maitake means butterflies dancing or dancing mushroom. Maitake's Latin name Grifola frondosa refers to the griffin of mythology with the head, wings, and front talons of an eagle, and body and back legs of a lion. Maitake are native to northeastern United States and Canada, China, and Japan. They grow at the base of oak trees, and occasionally maple and elm. Maitake's delicate, rippled cluster appearance resembles butterflies dancing. They are highly valued in Japan for flavor and healthful properties and affectionately called the dancing mushroom. Finding a maitake in the woods would cause the finder to literally dance with joy. In old Japan, maitake were readily exchanged for their weight in silver, with some mushrooms weighing 50 to 100 pounds. Maitake locations were carefully guarded secrets, even within a family. Americans call maitake Hen of the Woods or Cloud Mushroom, their rippled clusters reminiscent of ruffled feathers or cloud layers. Recently researchers are calling maitake the King of Mushrooms because of their many health promoting qualities. Wild maitake are a rare find, today. 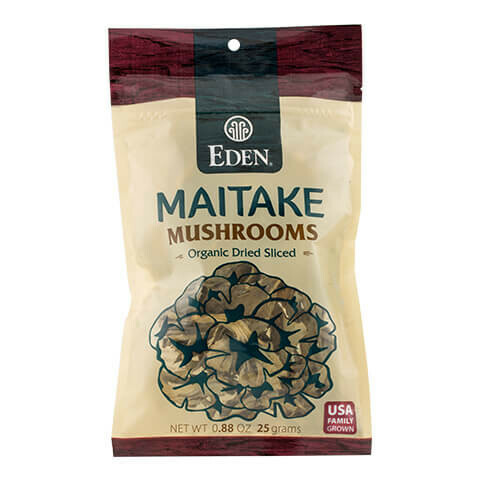 Eden Maitake are organically grown in Pennsylvania by a family that has cultivated mushrooms since 1927. 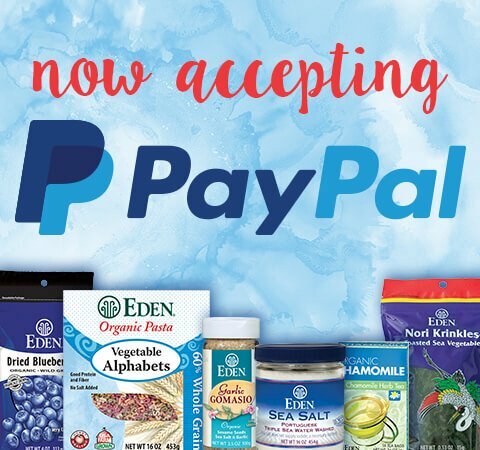 Eden Maitake are grown without the use of fungicides, chemicals, or preservatives. These home grown mushrooms are exceptional. Maitake grow to maturity in about 60 days and are then air-dried. Mushrooms are the only vegetable source of vitamin D in the form of the sterol ergosterol, the vitamin D2 precursor, just as beta-carotene is the vegetable precursor of vitamin A. When exposed to light, the ergosterol is converted to vitamin D2. All mushrooms contain vitamin D2, but maitake contain much more. The common button or white mushroom contain less than 1% daily value (DV) vitamin D, while Eden Maitake contain 50% DV of vitamin D. They are also rich in B3 niacin. 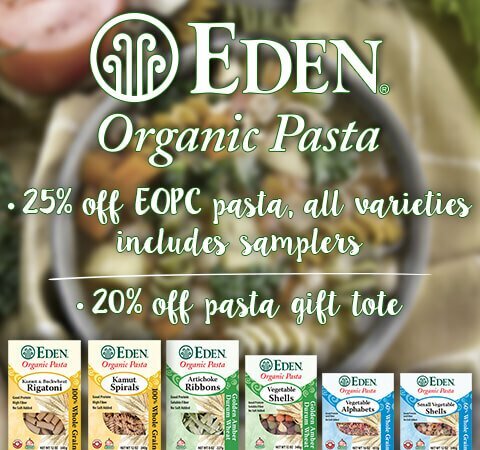 Organic Eden Maitake are used the same way as fresh mushrooms or other dried mushrooms in soups, stews, stir fries, grain and pasta dishes, sauces, and casseroles. Maitake's flavor blends well with grain, beans, seafood, meats, and vegetables, add a touch of garlic and Eden Shoyu Soy Sauce. 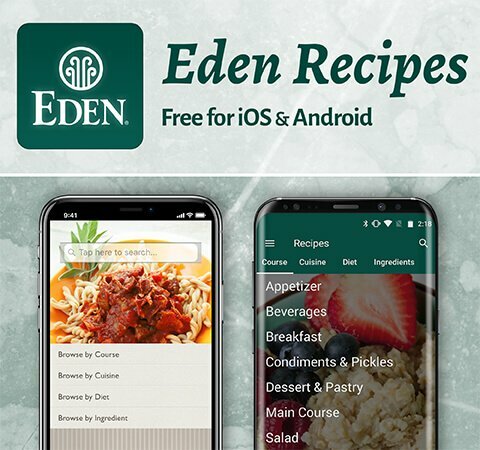 Try combining maitake with fresh shiitake or any fresh mushroom or with Eden Sliced Dried or Whole Dried Shiitake mushrooms in marinara, creamy white sauces, and gravies. Simply rinse quickly and soak to reconstitute. Soaking water may be reserved and used as part of a recipe or for soup stock. Only the large, thick pieces may require slicing for even cooking. In recent studies of maitake's polysaccharide carbohydrates, especially beta glucan, these may be responsible for maitake's immune strengthening properties. Maitake also relieve side affects of chemotherapy such as nausea and hair loss. According to Barrie Cassileth, Ph. D., Chief of Integrative Medicine at New York's Memorial Sloan-Kettering Cancer Center, "One of the beauties of maitake is that it has no toxicity and no side effects. It's a no lose product. It may be helpful, but it's not harmful, and it doesn't interfere or interact with chemotherapy."